At Coventry University we believe in our people and recognise the need to invest in our staff. As an institution we are very proud of our apprentices as they enable us to achieve success by helping to build capability and providing an inspiring environment in which to work. Our apprentices have demonstrated increased self-ownership, communication, team building and collaboration, building on the components embedded into our staff capability framework. We are actively looking at job roles where Apprenticeships can fulfil recruitment needs, scoping a pipeline of progression. We plan to extensively grow the number of staff Apprenticeships as new Apprenticeship standards are released and as we continue to invest in our staff, students and facilities. An Apprenticeship is a combination of employment and training to gain a recognised standard and essential skills for a chosen role or occupation. Apprenticeships can be offered to existing staff or new recruits for those who want to acquire new skills and knowledge to increase performance. 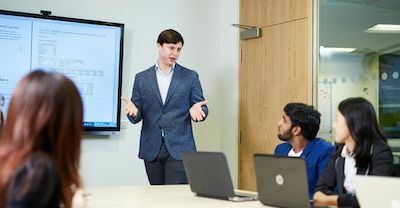 Coventry University as an employer trains individuals, so apprentices contribute to the organisations productivity whilst developing their own skills. Learning takes place within context and provides understanding, combining practical skills with theoretical knowledge. Degree Apprenticeships were launched in September 2015 and are a relatively new model to be delivered as part of Higher Apprenticeship standards, apprentices achieve a full bachelor’s or Master’s Degree as a core component of an Apprenticeship. Degree Apprenticeships combine both higher and vocational education and fully test both the wider occupational competence and academic learning, either using a fully integrated Degree, co designed by employers and Higher Education Institutions, or using a Degree plus separated end test of professional competence. The standards focus on how an apprentice should demonstrate a mastery of a specific occupation laid out for Degree level Apprenticeships at 6 and 7. The content of Apprenticeships standards varies from sector to sector to support full competence in an occupation displayed by appropriate knowledge, behaviours and experience to be able to fulfill the role. Look out for Discovery Day staff awareness events via Staff Comms, as we launch different levels and occupational areas.